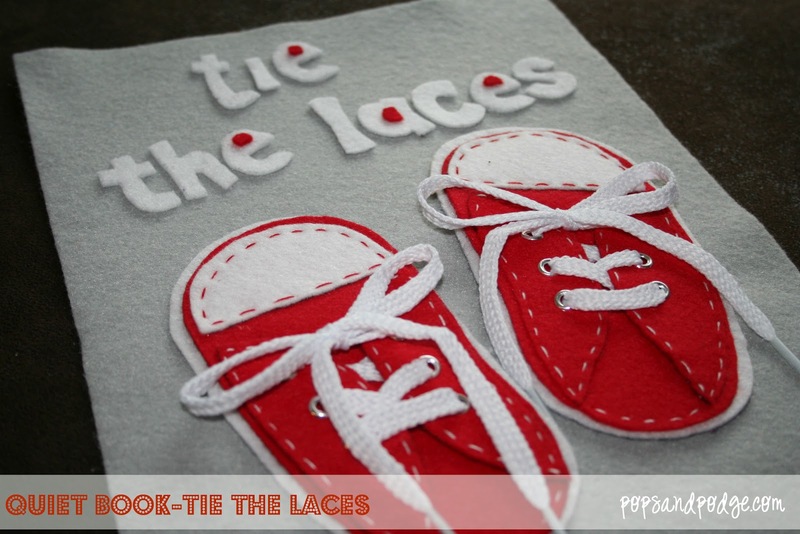 Pops and Podge: Quiet Book Page 3--Tie the Laces! Quiet Book Page 3--Tie the Laces! I have uploaded the pattern here. First trace and cut all your felt out. Before you glue everything on construct your shoes. It helps to layout the pieces first, so you know where everything goes. Iron on the interfacing on the back of the 4 pieces that will have the grommets. You won't see that pictured here, we added this step, because we had trouble with the grommets coming out. The interfacing should help. You can then put the grommets on. Three per side, six per show, twelve total. Then stitch with white thread on the inside of each grommet flap. Next, stitch the white shoe tip to the smaller shoe piece with the colored thread like below. Then stitch again with the white thread. All the way around the colored shoes from the top of the flap outer edge to the top of the other flap. You can then glue the white larger shoe shape to the smaller colored shoe shape. Glue down your letters and the whole shoes. Thank you so much for sharing the template for this quiet book page - it's adorable! We're Still Here, I Promise!